THE KEY TO MAKING A LOT OF CA$H AS A SELLER IS IN THE PREPARATION OF YOUR ITEMS! 💲💲💲We want to help you make top dollar on your items! Check out our tips! Be sure you join our Sellers Only group on Facebook once you've registered so you can keep up on other tagging tips! Later Gator Sales has specific requirements for prepping items so they sell fast & make top dollar for you! 💥NEW SPRING 2019 - ITEM LIMITS: Each seller will be limited to an overall total of 500 items in their inventory. 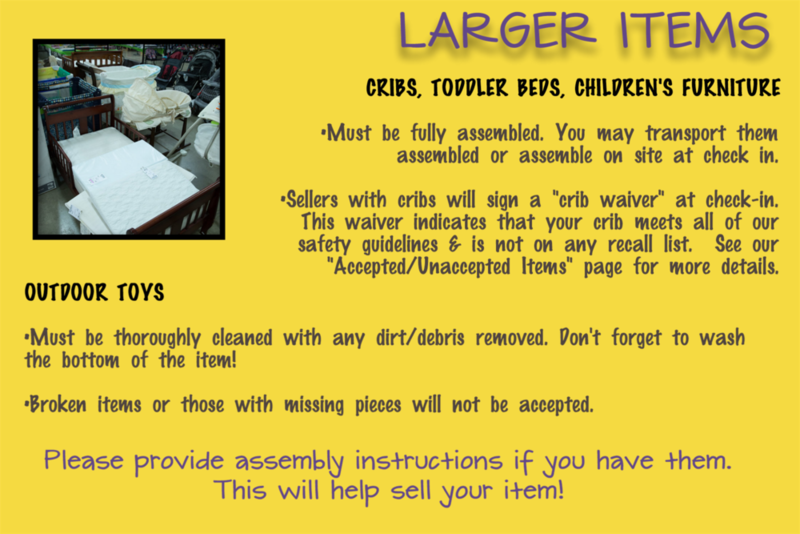 Of those 500 items, you may bring 150 items sized 0-18 months. If you would like to bring more than these amounts, please contact us. WHAT DO YOU MEAN I CAN ONLY BRING 150 ITEMS IN 0 - 18 MONTHS?! Does this mean I can only bring 150 onesies? No! You can bundle and make outfits! You can sell several onesies at one time by rolling them & placing into zip lock bags or securing multiple hangers together and entering items on those hangers into the system as one item. A onesie & pants sold together will count as ONE item. "NO THANK YOU" ITEMS: Items that do not meet our sale standards. We know that most of you have the best intentions and sometimes miss a stain or hole. We will allow every seller 10 "grace items". After 75 “No Thank You” items check-in will be stopped; you will be contacted by Later Gator to pick up your items & you may be restricted from selling in future events. DOUBLE CHECK that your items are CLEAN & SAFE! 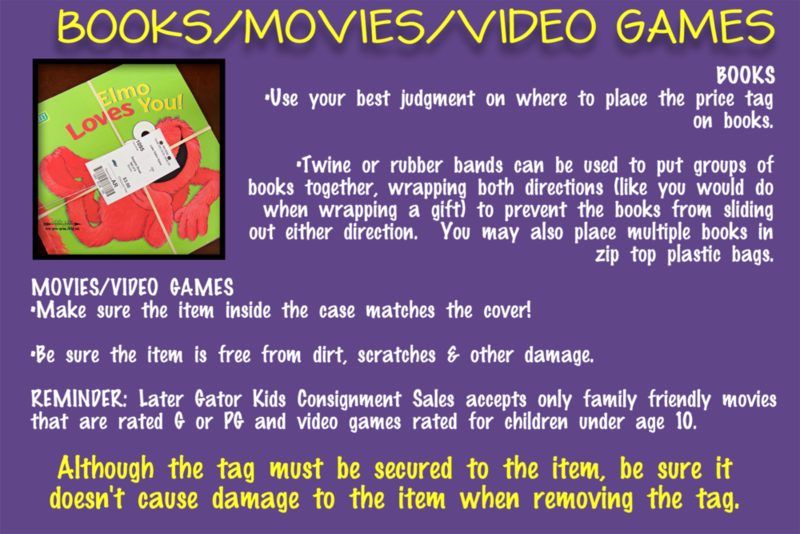 Be sure all toys have been wiped clean & are free of any damage. Also, be sure your items are not on any recall lists! CLICK HERE TO Check the Consumer Product & Safety Commission recall lists to be sure you don't have any recalled items! Please have your hanging items in order by size AND by item, starting with the smallest size up through the largest sizes!! (All shirts together & organized by size, all pants together & organized by size, etc.) This will help speed up our check in process!! 💲GATOR PRO TIP: Make top dollar on all of your items! 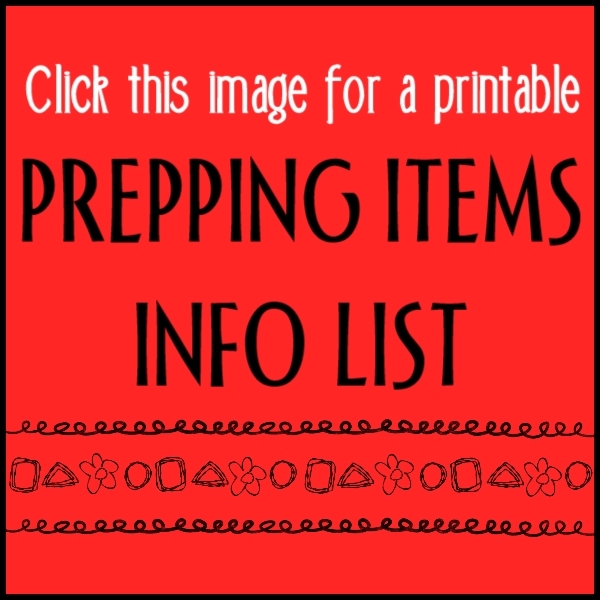 Check out the slide show below for preparation "must-do's". You can click on an image to view it again. Image used with permission from Green Jeans Consignment. Follow these guidelines for tagging gun & safety pin placement. Tags may be attached using a tagging gun or safety pins. Please refer to the image for proper placement of your tag. Improper placement of your tag could cause damage to your item & cause it to be rejected at drop off. If your item has a tag on the inside collar - place your tagging gun or safety pin through the tag. If it does not, pin or tag through a seam. Consider where you would find a tag on clothing at a department store. You would not find it through the middle of the fabric...but in a seam, often in the armpit or the end of the sleeve on tops or through the waistband on pants. Tagging supplies (card stock, tagging guns, safety pins, etc.) can be purchased at most stores. You can find links to some of our favorite tagging supplies below! Below are some of our favorite supplies we use while tagging. Please note, that of these items, the card stock is the only supply we require...all other supplies are optional for you...but many of them will make tagging a lot easier! You might find better deals on some of these items locally. We encourage you to shop around for the best deals! Our tags print 6 per page of cardstock, so a little cardstock goes a long way! The pack with 75 sheets of cardstock would be enough for 450 tags! 💲GATOR PRO TIP: Because of the size of holes that a tagging gun creates, YOU MUST ATTACH YOUR TAG through the garment’s sizing tag. If there is no size tag, attach the tag THROUGH THE ARMPIT SEAM. Think about where you find tags at a department store...not in the middle of the shirt, but in a seam. A seam in the clothing is a great place to avoid leaving a hole in the garment. Items brought to our sale with damage from improper tagging will not be accepted & will be subject to a fee. Some small holes can be repaired. Click on LEARN MORE to find out how! CLICK ON THE IMAGE ABOVE TO FIND MORE PLACES AROUND YOUR HOME THAT CAN EARN YOU EXTRA CA$H!! !